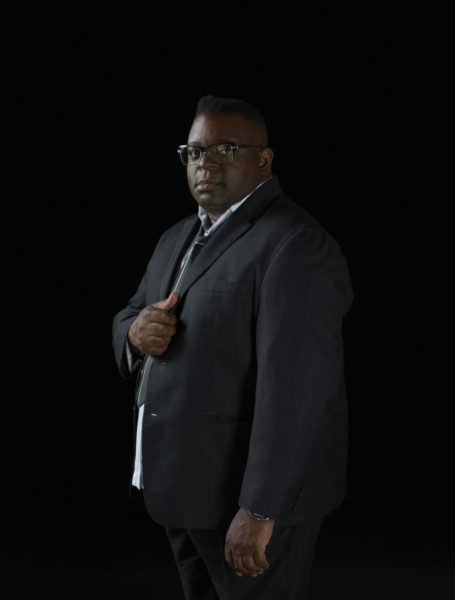 American photographer Catherine Opie shot to prominence in the early 1990s with a spectacular body of studio portraits of gay, lesbian and transgender women and men drawn from her circle of fellow artists and intimates in Los Angeles and San Francisco. 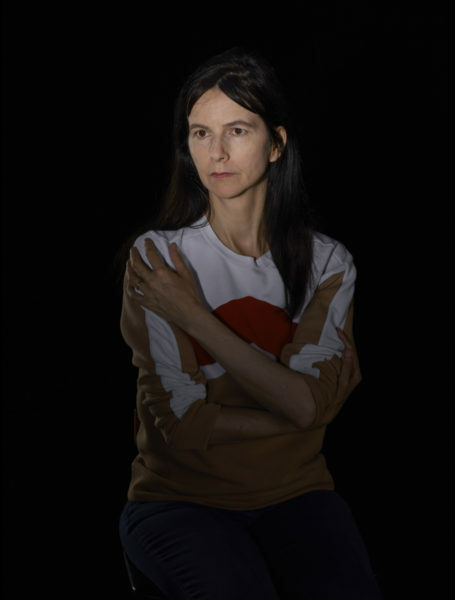 Her practice, sometimes described as ‘social portraiture’, spans across portraits, seascapes, landscapes, scenes of American domestic life, freeways, malls, cities and political rallies. The artist, who is considered one of the leading photographers of her generation, explores notions of identity and community and the way they shape one another. Her imagery also continuously explores the relationship between painting and photography. Opie’s most recent body of work Portraits and Landscapes is currently on view in a solo-presentation at Thomas Dane Gallery. Once again the artist has turned her lens to her peers. 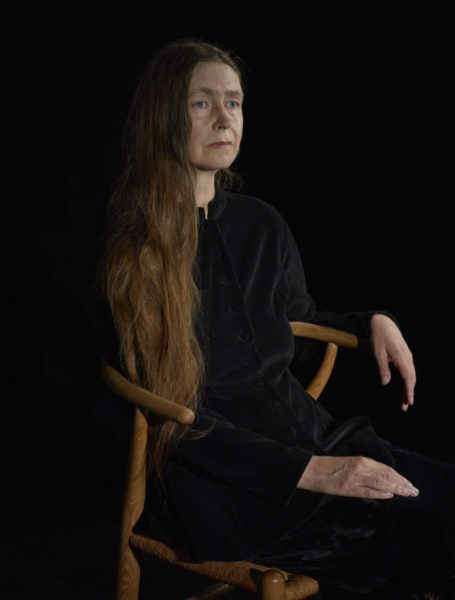 Her series of studio portraits, which also includes one self-portrait, depicts renowned contemporary British artists and international creative figures, many of whom Opie has known for a long time. 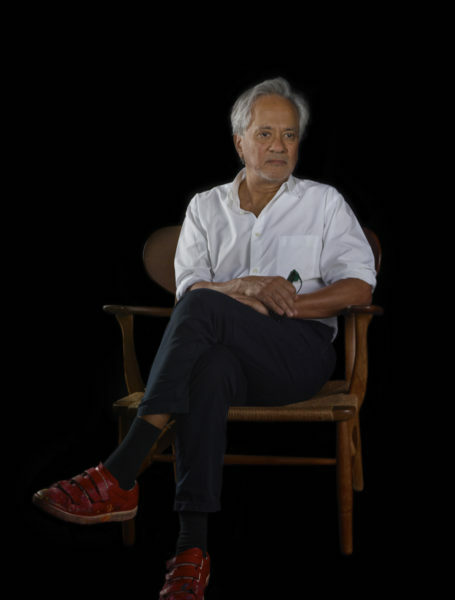 They include David Hockney, Anish Kapoor, Gillian Wearing, Isaac Julien and Lynette Yiadom-Boakye amongst many others. The sitters are carefully posed in front of a black curtain and lit with theatrical light. The highly staged photographs share a pictorial sensitivity with European 17th Century portraiture painting, bringing into mind the sparse compositions and chiaroscuro effects of Diego Velazquez’s Baroque portraits of the Habsburg dynasty. Like in the paintings of the Old Masters, the faces, expressions and gestures of Opie’s subjects are rendered in intimate detail. 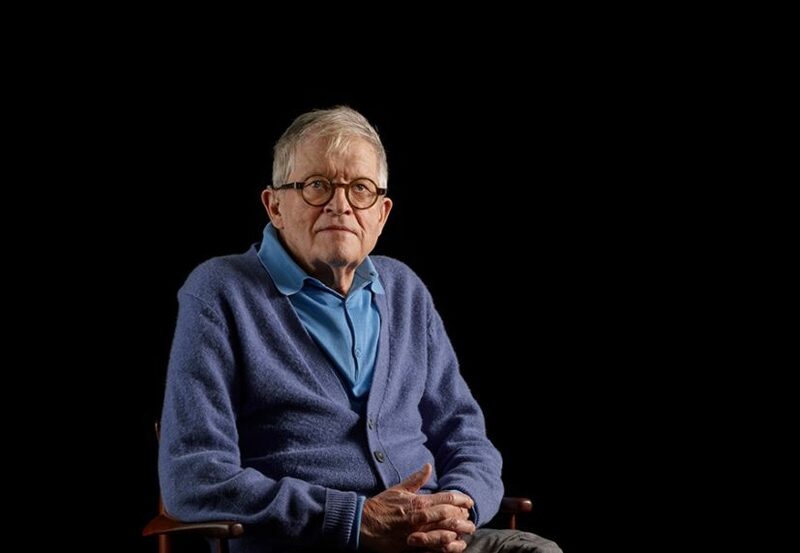 However, features like paint splatters on David Hockney’s trousers and his hearing-aid tucked behind his ear, or Lynette’s Yiadom-Boakye’s contemporary jewellery, strongly root Opie’s portraits in the present. Most of them were shot this summer in a photo-studio close to Waterloo station. Many of the depicted artists work in the genre of portraiture themselves. Catherine Opie carefully considered her protagonists’ practise when staging her compositions. For instance, in Celia Paul’s own painted self-portraits we never see her hair and she usually folds her hands in her lap. Opie looks at her in a new way by revealing her hair and having her rest one arm on the chair. 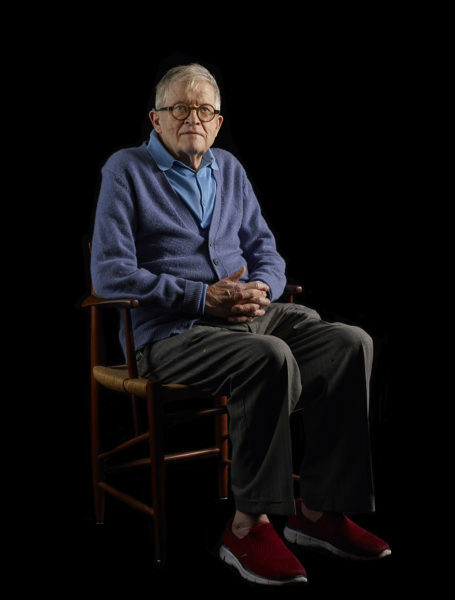 When portraying Anish Kapoor, Opie asked herself how Hockney would have painted him, so she cut off the tip of one of Kapoor’s shoes, which is a recurring pictorial element in Hockney’s compositions. A large-scale abstracted landscape photograph Untitled # 15 (2017) punctuates the series of portraits. Here Opie reduces the often captured White Cliffs of Dover into abstract and monochrome blurry forms, adding an almost painterly contrast to the human portraits in the show. The landscape image acts as a reference to the legacy of American landscape photography and painting. 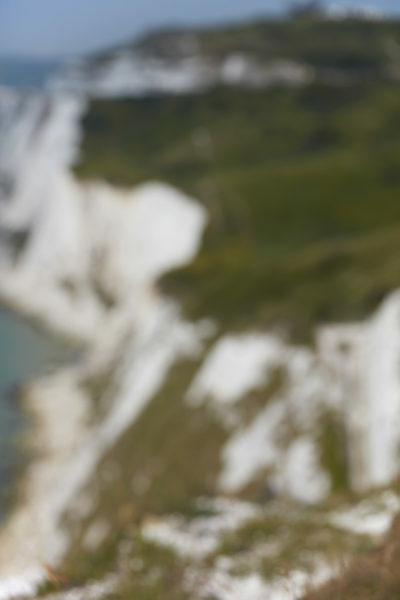 However, in this period, when Britain is preparing to leave the European Union, the vista of this iconic landscape that forms a natural border between the UK and Europe can bring current political topics around Brexit into mind. Overall, in an era in which we are used to flicking through images on our mobile phones, Catherine Opie’s subtle and quiet portraits successfully manage to captivate us with their psychological intensity, their precision of details and their masterly play of colour, light and form. Only when we take time to slow down and immerse ourselves into the intimate studies of her friends – maybe in a similar way to how we would study the painting of an Old Master in a museum – can we explore the vulnerability and intimacy of each sitter and the humanity of Opie’s subjects above all. At the same time we are pushed to reflect on the meaning of artistic studio photography in a time when we consume short-living snapshots or our friend’s staged ‘Selfies’ on Instagram or Facebook. 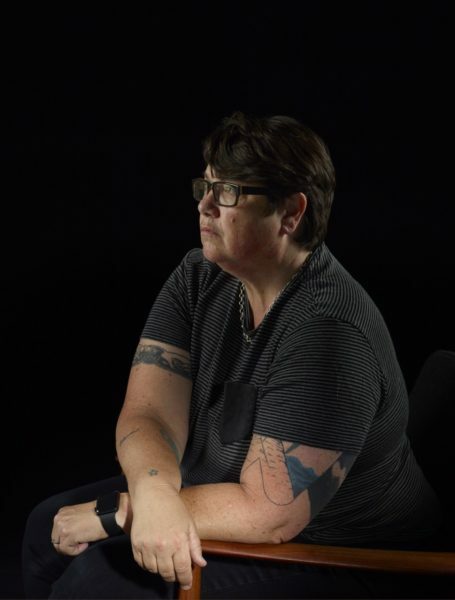 Born in 1961 in Sandusky, Ohio, Catherine Opie received a BFA from San Francisco Art Institute and an MFA from CalArts. Since 2001, she has been a Professor of Fine Art at UCLA. Her work has been the subject of major exhibitions at the Wexner Center for the Arts (2015), the Institute of Contemporary Art, Boston (2011); Los Angeles County Museum of Art (2010); Guggenheim Museum, New York (2008); MCA Chicago (2006); and the Walker Art Center, Minneapolis (2002). Her work is held in many public and private collections internationally. In 2014 the Contemporary Art Society acquired a work from Opie’s 1990s Girlfriend series to support the Liverpool Walker Art Gallery’s ambition to collect work related to lesbian, gay, bisexual and transgendered themes and communities. Running concurrently with the exhibition at Thomas Dane Gallery is Opie’s first major European survey exhibition, at Henie Onstad Kunstsenter, Norway. Catherine Opie lives and works in Los Angeles.